One of the most fascinating and enigmatic pieces of evidence of Nabataean ingenuity is the so-called Zodiac of Khirbet et-Tannur (Jordan), found in a temple built at the mountain summit close to Djebel Tannur in the first half of the second century CE, possibly when the ancient Nabataean Kingdom was already under Roman rule. However, Nabataean traditions and cults persisted during the Roman period and even survived well into Byzantine times. But one important change was the imposition of a Julian-like calendar, of Egyptian inspiration, instead of the original lunisolar calendar of the Nabataeans—earlier inherited and adapted from the Babylonian one—whose month names were however preserved under a solar perspective and a new time framework entitled Era Provincia Arabia. An analysis of the dates reported in the foundation inscriptions of the first century CE rock-carved tombs at the southern Nabataean city of Hegra, and other dated inscriptions of the Nabataean Kingdom period, has given some clues for us to look at the Tannur Zodiac with a different perspective. This new way of thinking has allowed a completely different approach to this masterpiece of art which is substantially different to most previous interpretations (see e.g. McKenzie et al., ARAM Periodical 24:379–420, 2012). According to our hypothesis, we consider that it should be formally named the ‘almanac’ or ‘parapegma’ of Khirbet et-Tannur hereafter. 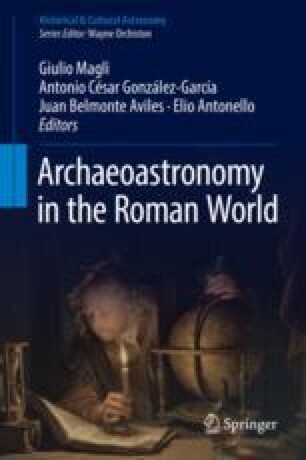 This work has been financed under the framework of the projects P/310793 ‘Arqueoastronomía’ of the IAC, and AYA2015-66787 ‘Orientatio ad Sidera IV’ of the Spanish MINECO.